During times of conflict, from ancient ages through to the modern day, felines have frequently been in the thick of the action on the front line and essential to war work behind the scenes. 1. One of the greatest and most powerful of the Egyptian pharaohs, Ramses II (1303-1213BC), was, quite literally, a big-cat lover — his personal favourite of all the felines in his palace was an adult male lion. His name translates as ‘Slayer of foes’ and ‘Invincible’ and, as well as being a pet, he accompanied Ramses into battle. He was at his side during the famous encounter at Kadesh against the Hittites in 1274BC where he achieved renown as being one of the few members of the Egyptian army not to flee in panic when ambushed by their foes. 2. Following the adage that ‘all is fair in love and war’, the Persians shamelessly exploited the Egyptians’ well-known love of cats to defeat them in battle in 525BC. They painted images of cat goddess Bast on their shields, and then drove hundreds of cats ahead of them as they advanced on the Egyptian army, which immediately capitulated, terrified of harming any of them. 3. According to legend, it was cats who were really responsible for the English victory at Agincourt in 1415. During the campaign in France, the English troops took cats with them to help guard their stores from vermin — a precaution the French hadn’t bothered with. Consequently, the bowstrings of the French archers were nibbled by rats and mice, whereas those of the English survived undamaged. 4. In the 16th century, German artillery officer Christopher of Habsburg devised a cunning plan. He proposed attaching jars of poison gas to the backs of cats, which would then be driven among the enemy troops where they would spread a lethal combination of alarm and poisonous fumes. Although the idea was put forward to the Council of One and Twenty in Strasbourg, it was never adopted. 5. One of the often overlooked heroes of the Crimean War (1854-55) was a tabby cat named Tom. When the allies took possession of the city of Sevastopol after a year-long siege, it seemed that there was little left by way of food. With the Russian winter approaching, things looked grim for the British troops, who faced the prospect of starvation. Their saviour turned out to be a friendly little cat found in a cellar by Captain William Gair of the 6th Dragoon Guards who took him back to the officer’s quarters. He appeared healthy and well-fed, with no shortage of rats and mice to hunt, which gave some of the men the idea of following Tom on his daily excursions away from the compound. He led them to a pile of rubble which, when cleared, revealed a cache of food left behind by the Russians. During the following weeks, he led them to many more hidden stores. The food attracted Tom. 6. Modern research has confirmed that stroking cats can relieve stress, lower blood pressure, and release the feel-good hormone, oxytocin, validating their employment as therapeutic visitors in hospitals and nursing homes. None of this would have surprised another hero of the Crimean War, Florence Nightingale, who was already streets ahead of modern science in recognising the beneficial hands-on effects of cats, and so was thrilled by the gift from a soldier of a kitten. ‘A small pet is often an excellent companion for the sick or long chronic cases, especially,’ she said, and after her nursing efforts in the Crimea ravaged her own health, she took her own advice, acquiring around 60 cats in her lifetime. 7. 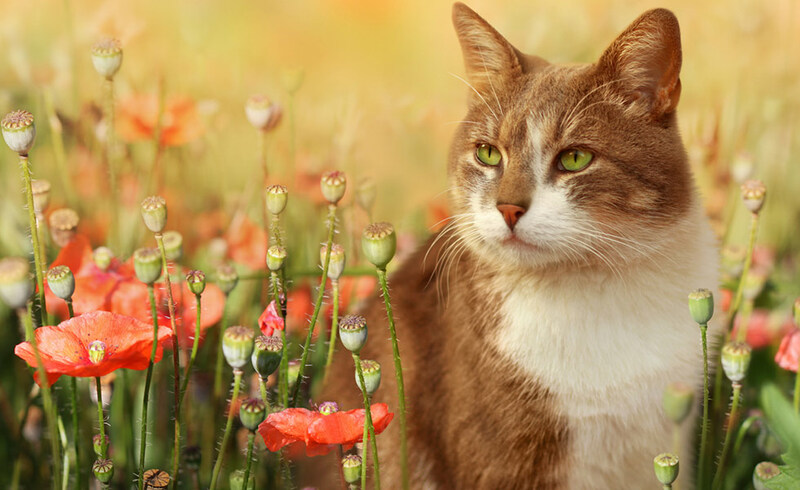 During World War I, some 500,000 cats were employed by the British Army as gas detectors and ratters in the trenches. And again, in World War II, the role of cats as guardians of food stores was deemed so vital to the war effort that thousands were donated by the British public and also by the US via a ‘Cats for Europe’ scheme. In Britain, it was illegal to give milk to cats to drink — a rule that was relaxed for felines engaged in essential war work as mousers, who were allocated a dried milk ration. 8. Two cats and a dog who were observed repeatedly crossing British trenches during WWI were suspected by British intelligence officers as being spies in league with the Germans. Orders were immediately issued to apprehend them, although it is not known whether they were eventually captured or not. The idea of spy cats is perhaps not as far-fetched as it might sound. During the siege of Stalingrad in 1942, a Russian cat named Mourka braved heavy sniper fire to carry messages between companies about enemy gun emplacements on a daily basis. 9. Going a step further, during the Cold War in the 1960s, the CIA launched the ‘Acoustic Kitty’ project in an attempt to listen in on secret conversations in the Kremlin and Soviet embassies. All wired up for sound, the first cat to be recruited and sent on a spy mission in a park was promptly knocked down by a passing car. The people responsible for the idea were evidently unfamiliar with the independent nature of cats. The difficulty in training felines to behave as required proved to be a major drawback to the project and, with some embarrassment, it was quietly dropped. 10. Many World War II aircrew kept cats as mascots, and more than a few even accompanied them on missions, even though it was against the rules. One such famous kitty was Windy, who clocked up many air miles with owner commander Guy Gibson — the famous Dambuster bomber pilot more usually associated with a black Labrador. It wasn’t just English cats who took to the wartime skies. A cat found onboard a German bomber shot down in Wales gained notoriety as the first feline prisoner of war.